Its tough to find good laundry soap that works yet is still okay for baby and kid’s cloth diapers and clothes. 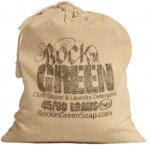 Rockin’ Green Soap offers 2 types of Rockin’ Soap…Classic and Soft. For Classic Rock, the scents you can choose are Cherry Almond, Buttercream, Lavender Vanilla, Fresh Lines, Mango Sorbet (the one I go to try and it smells soooo good), Cherry Lemonade, Monkey Snacks, Baby Powder and Grape Soda. All sounds yummy eh? It also comes in unscented as well. Classic Rock Formula is great for diapers and regular clothes so you can use it on anything and everything. Soft Rock is the unscented version that is gentler than the original and is great for little ones that have sensitive skin. 45/90 Load Bags retail for $13.95. Rockin’ Green Soap is Dye Free, No Fillers, No enzymes or optical brighteners, 100% Phosphate free, Vegan, Great for sensitive skin, easy rinsing formula and approved military use. It works wonders on microfiber stink, perfect for you cloth diaper users, HE compatible, reusable packaging, great for all water types and Economical at .13 cents a load. And it works awesome!!! I put it to the test from clothes, towels, and yes…Kendall’s greasy work clothes. I give it 5 stars all the way.